Some of you might know that January was Use up Your Scraps month for me and a few of my followers. Well I have decided to continue to use up my scraps to make as many projects as I can. So here is a photo record of said projects either in progress or finished. January 2013 is Use up Your Scraps month. I will be posting ideas on how to use the contents of your fabric scrap bins shortly. I’m hoping other bloggers will do the same. I will try to stick to the fabric scraps busting ideas but I’m sure there are one or two of you out there who have plenty of paper scraps that they could use in scrappy projects. 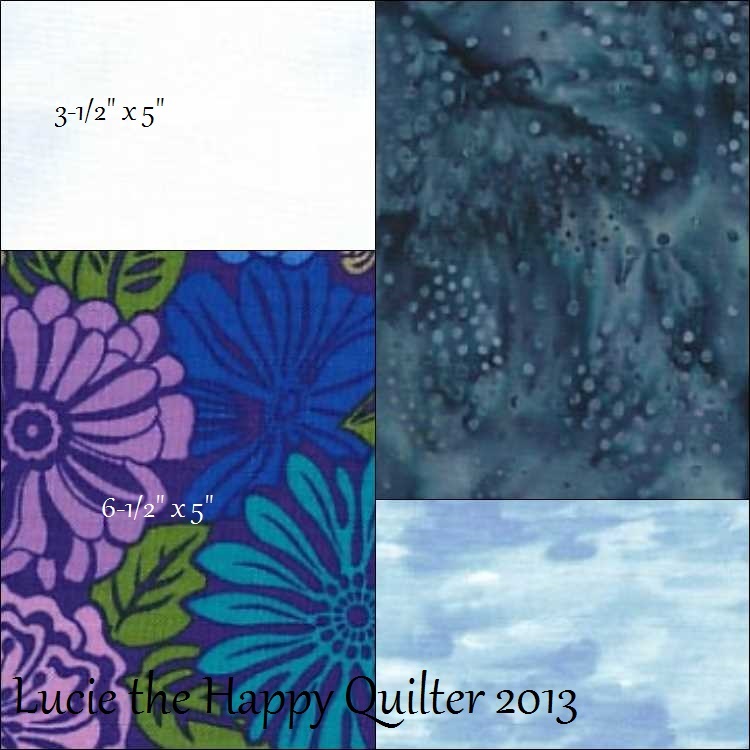 ♥ My first suggestion is looking at the free downloads posted by the major fabric companies. 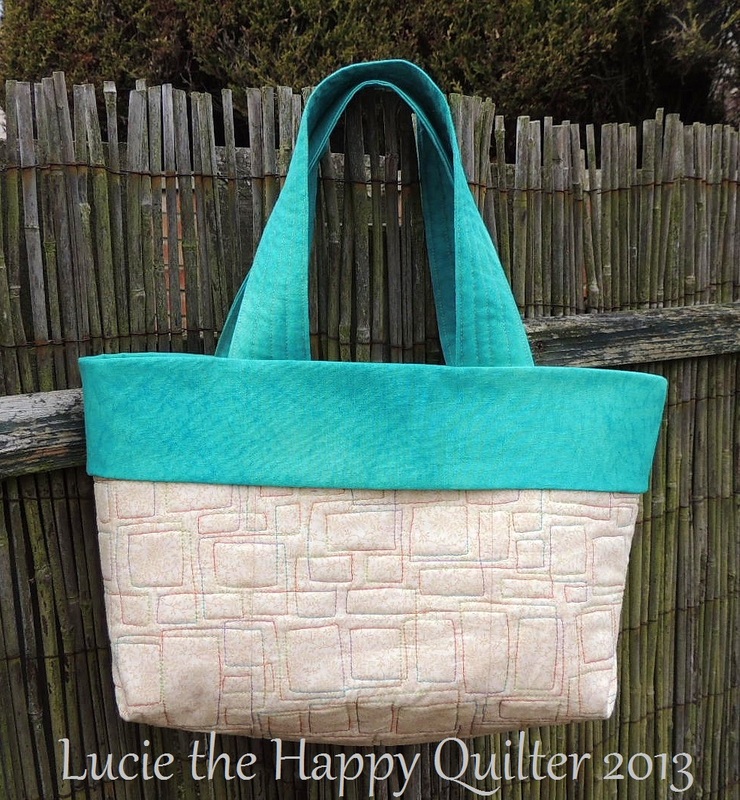 Click here to peruse the free patterns from Lecien. I’m sure these patterns can be adapted to work with scraps. ♥ Here’s another suggestion for using up your scraps which was brought to my attention by my lovely friend Kate the Historian. It’s a great idea for a cushion but could very easily be turned into a wall hanging. 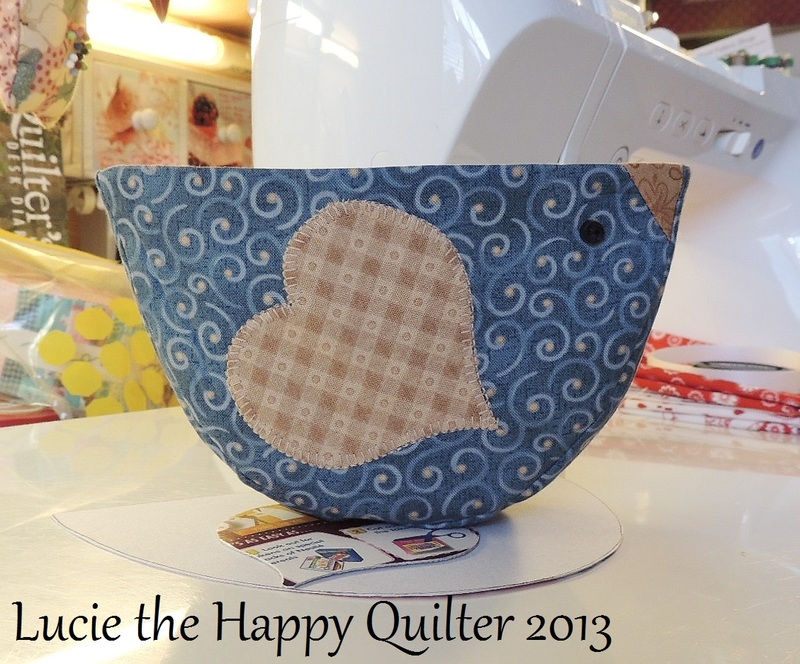 Kate found this idea on the Cluck Cluck Sew blog. I just may have to make this one before January arrives. Here’s my latest scrappy project. I really enjoyed making this little thread catcher. I’m planning on making other sewing related BlueBird themed projects. It’s finished! I plan on hanging this little applique quilt on my sewing room door. I did a spot of Freemotion Quilting this morning and then added the binding this afternoon. I plan on adding a hanging pocket. So if you happen to visit me and my longarm quilting system in the near future you will see my Topeka Rose on your way into the room. 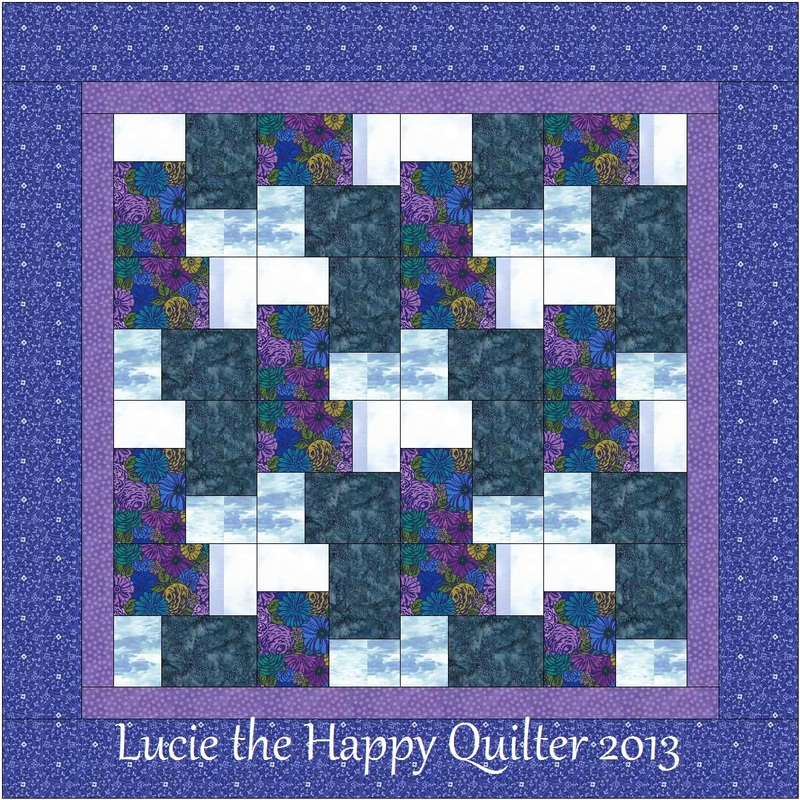 This is the perfect size project for practicing your Freemotion Quilting on. So why not have a go. 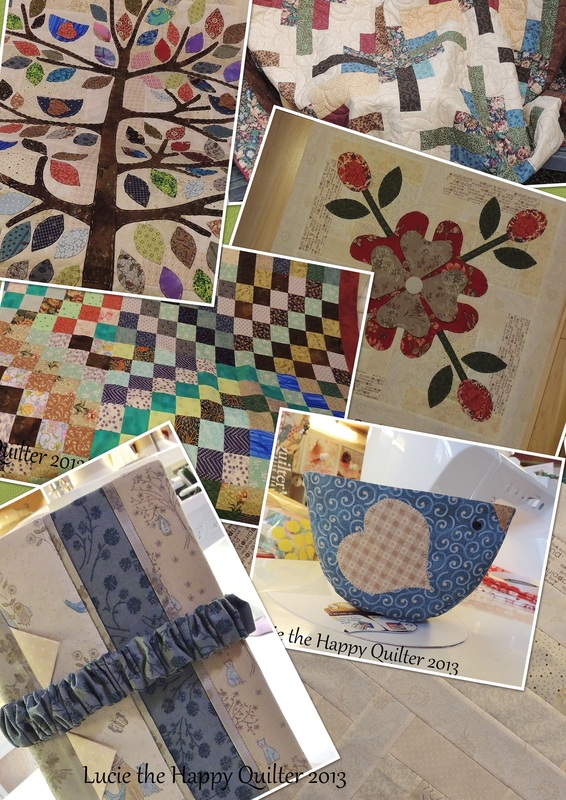 You can kill two birds with one stone; you can Use up Your Scraps and you can get a Freemotion Quilting practice session in. I have been working on a Scrappy Trip Around the World this weekend. You will find the instructions for this block here. It’s a brilliant scrap buster. I found the instructions quite easy to understand. Once I worked out how to press the seams so they lock together and spread the bulk piecing the blocks was a breeze. I spent most of today longarm quilting and the quilt I was working on was pieced using a very simple which I really liked the look of. 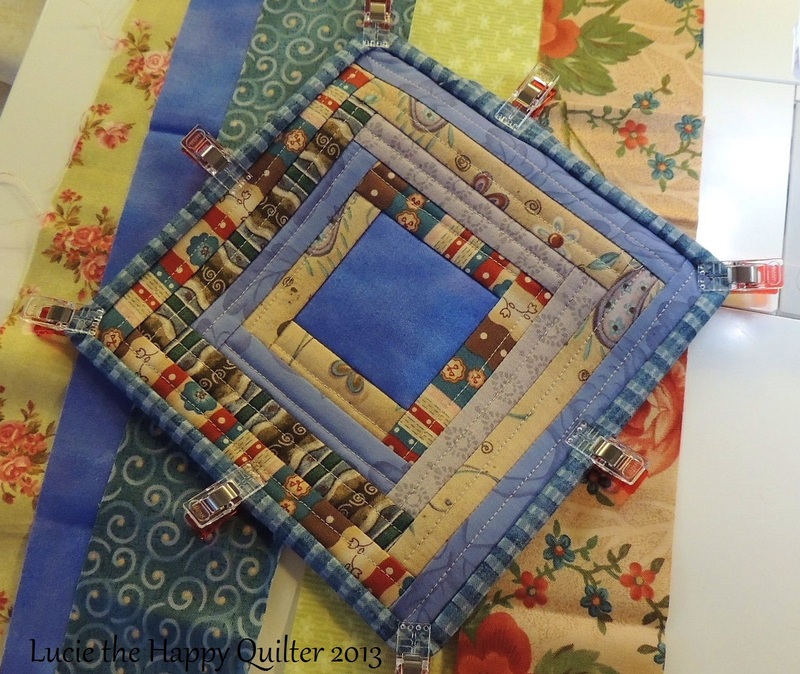 I think this block could be adapted for Use up Your Scraps month. 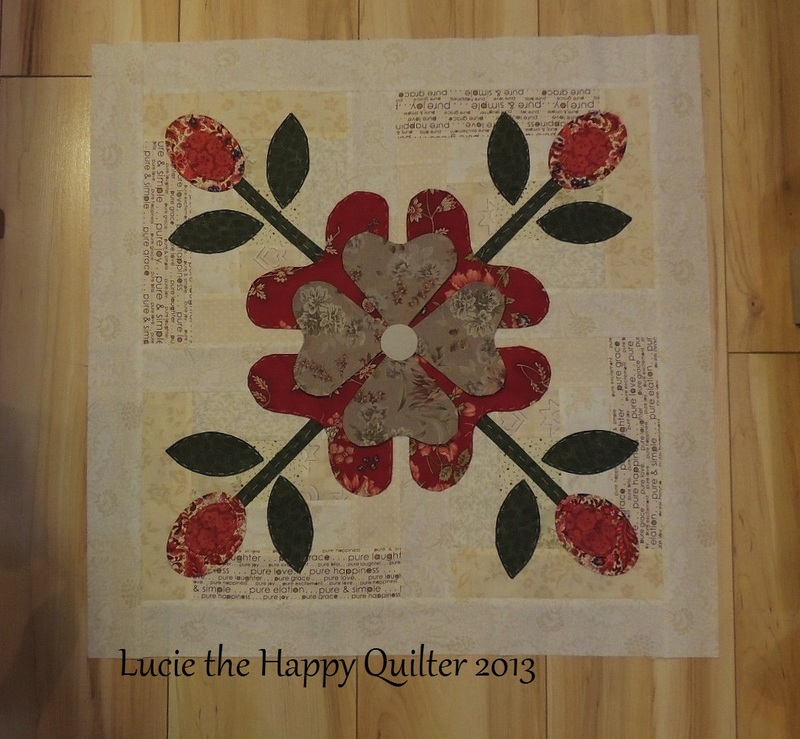 Here is the quilt and the block. Don’t mind the fabrics/colours I have used for illustration purposes, just picture it in all over scraps. Here’s another idea for using up your scraps. I pieced several Scrappy Log Cabin blocks. 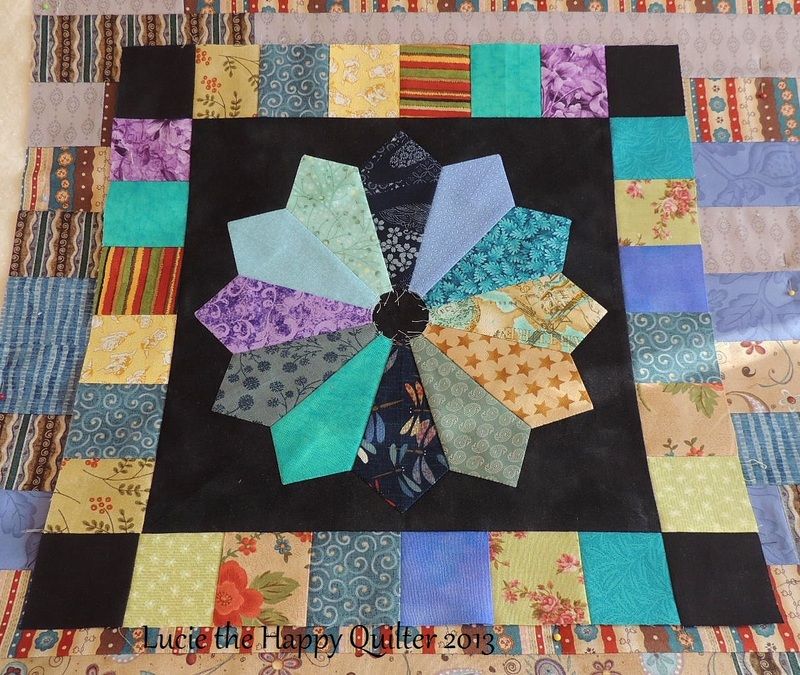 I pieced four together and added a border – all scraps from my scrap bins. Then I selected an applique design which in the end I simplified. The design is called Topeka Rose. I’m appliqueing the Topeka Rose onto the creamy Scrappy Log Cabin background. What do you think? I have another 24 creamy coloured Scrappy Log Cabin to do something with. I think I will do more applique but wonky style stuff. Watch this space for more news. 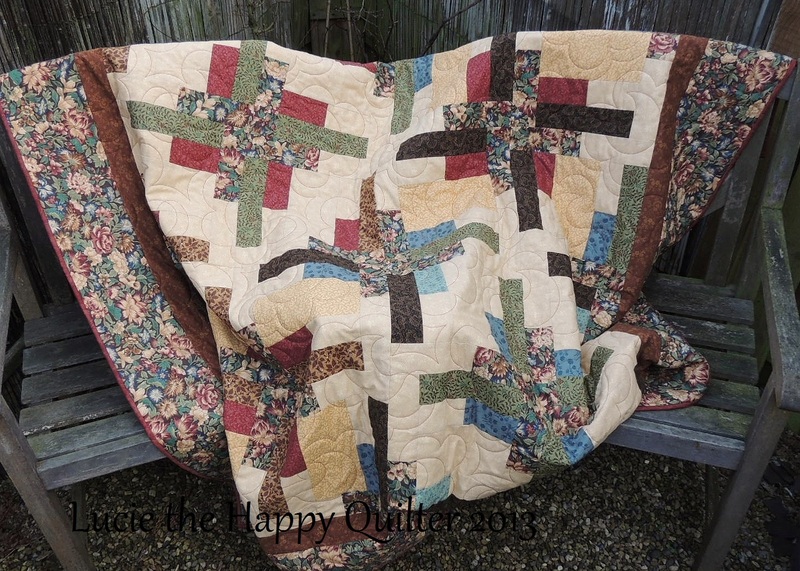 Well I finally got enough daylight to take a reasonable photo of my Lively Logs Quilt. 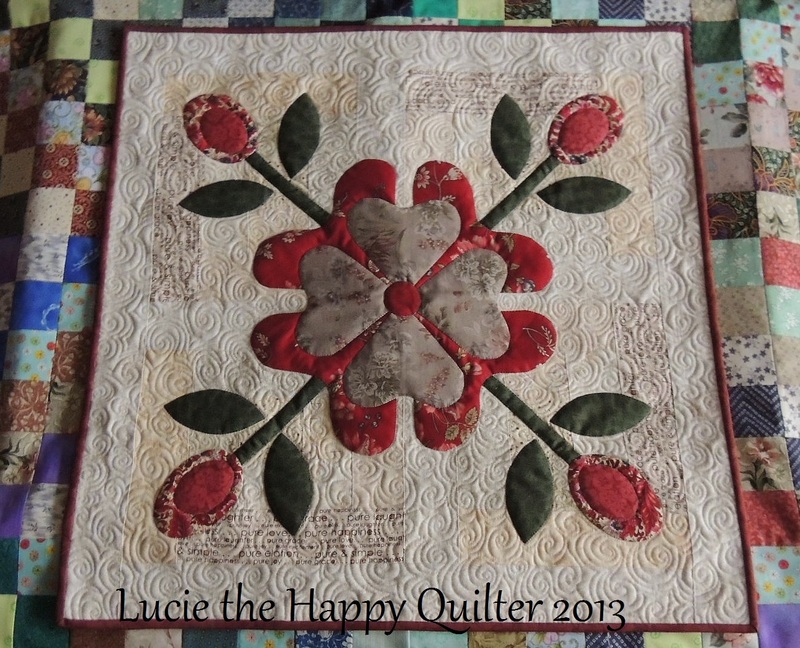 I’m really pleased with the longarm quilted result. Now it just needs a label. Here’s another idea to add to the list of scrappy projects. Today I pieced a simple Journal Keeper. I just worked out how big a quilt I needed, then cut rectangle shaped pieces, added some Prairie Points. Did a little walking foot work for the quilting and voila…. a nice little Journal Keeper. Here’s the riddle again: What can you make when you cut a selection of fabric scraps as follows: (6) 2” x 7-1/2”, (1) 2-1/2” x 9-1/2” and (3) 3-1/2” squares. Well here’s one version of what you can make. I think this simple design would make great placemats. This piece measures 12” x 9” making it a very good size for placemats. I’ll post a photo of the quilted article sometime soon. Now the question is, can you re-arrange these same pieces to make another design? Email me a photo if you can. This is a very simple block to piece. Because I had big enough scraps I was able to use the pieced strip and cut into sections method. This block will work just as well with smaller bits. Here are the instructions for pieced strip and cut into sections method: I pieced this block from the centre outward. So I started by cutting the centre rectangle 4-1/2” x 8-1/2”. The next thing I did was cut 2 strips of 1 light and 1 medium/dark 4-1/2”. I sewed both strips together, pressed the seam toward the dark. Cut 2-1/2” sections. Notice how I have arranged and sewn these sections to either side of the centre rectangle. It’s this colour arrangement that defines the pattern. Next cut 1 strip 2-1/2” strip medium/dark fabric and cut 8-1/2” which you add to each side of the two colour sections. And then the last step is to cut 1 strip from 1 light and 1 medium/dark fabric. Once again sew the strips together, press the seam toward the dark. Cut section of 2-1/2”. Sew sections to the top and bottom of your block. Now if you’re not lucky enough to have big leftovers to work with you just simply cut the patches the sizes listed on diagram 1 below. It’s all quite straight forward to work from the diagram. When it comes to joining the blocks you simply alternate the direction of the blocks to form the design which you can see in diagram 2. I can’t tell you how much fabric you’ll need because I have no idea what size of project you will be working on. Remember that the more variety of fabrics you use the more interesting you project will be. If you decide to try piecing this block please send me a photo so I can publish it. 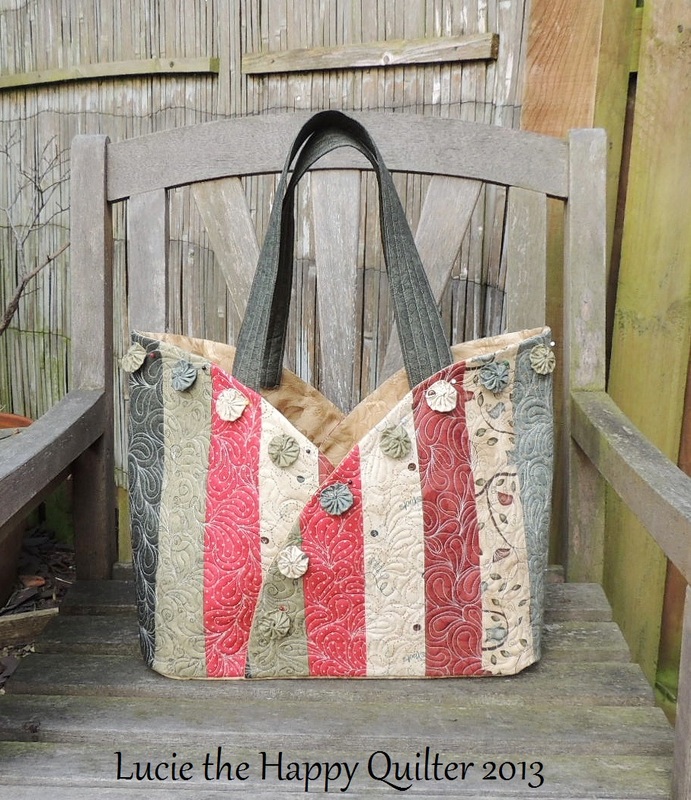 I’m looking forward to your scrap ideas, I have so many bags I can’t bear to throw away hanging around! I think I will concentrate on small manageable projects giving me short sharp bursts of sewing time. I love your scrap ideas! Welcome aboard. It’s going to be fun and just think of the sense of accomplishment at the end of the month when we have finished a few projects made from scraps. You make quilting look so easy. I struggle with patience, but still keep trying. I especially love the tree pillow and your journal cover. Nowadays I tend to stick to simple patchwork projects. That way I still get my fix of craftiness without struggling too much. I really enjoy making it up as I go along. Keep trying and you’ll get there. Thanks for popping in. Brilliant use of scraps. Please let me follow along. Hopeless at tech but passable quilter. You’re very welcome to follow along. If you’ve got a few scraps have a go. Thanks for popping in for a visit. Thank you Renee. I’m glad you found me too. You can purchase a Sew Easy Cutter Ruler from Amazon http://www.amazon.co.uk/Sew-Easy-Rotary-Quilting-Patchwork/dp/B005AF85YI/ref=sr_1_1?ie=UTF8&qid=1403895856&sr=8-1&keywords=sew+easy+cutter+ruler and the postage is free. I’m sure you will like this gadget. It works really well. I adore the half circle bag! Is there a pattern? No there isn’t a pattern at the moment but I am teaching it this month. I’m glad you like my bag Becky. Thanks for popping in. No I’m sorry there isn’t a pattern for the blue bird thread catcher. I just worked it out as I went along. Thanks for popping in.